The Avg. Group Saves 14.9%! Once a sleepy fishing village, Dubai has undergone rapid transformation since the 1980s, emerging as one of the most dynamic cities in the world. Under the visionary leadership of the Al Maktoum family, the emirate has successfully capitalised on its strategic location, at the crossroads of the Middle East, Asia, Africa and Europe, and has established a formidable reputation as a global hub for tourism and trade.During the 19th century, Dubai's pearl industry started to thrive. Merchants then flocked from all four corners of the globe to trade their wares in the city, based on its advantageous location - wrapped around a 10-km-long creek - which today remains a thriving commercial waterway. The discovery of oil in the 1960s fast-tracked Dubai's rise to fame, with the emirate ploughing funds into new industries and infrastructure. It led to the creation of bold initiatives such as the offshore Jebel Ali Free Zone and the world's busiest international airport, Dubai International Airport. 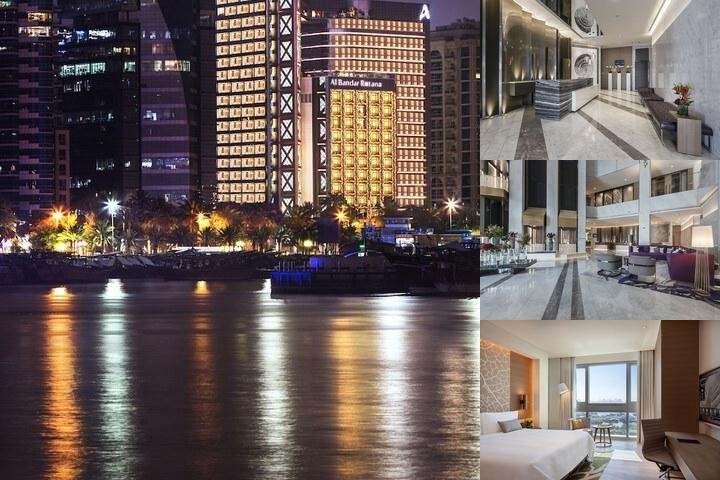 Situated on the north shore of Dubai Creek, the thriving waterway that runs through the heart of the city, Al Bandar Rotana is a five-star hotel with a prime waterfront outlook. Located on Baniyas Road in one of Dubai's most prominent business districts, the waterside hotel is just a few minutes by road from the world's busiest airport, Dubai International, as well as the Dubai World Trade Centre and the Diplomatic District. Major tourism attractions are on the property's doorstep too, from mega malls to world-famous souqs. The new Al Seef destination is rooted in Dubai's culture and heritage, with a charming atmosphere that fuses the heritage and modernity of the Emirate. The design-led Rise Dubai Creek Harbour development is also a short drive away, home to live music, DJ sets, movie screenings and unusual casual dining concepts.This modern, architecturally-striking property, features 190 uniquely-designed rooms and suites. Spacious, luxurious and featuring the latest amenities, options range from standard rooms to suites, ideal for business and leisure travellers and families visiting Dubai. Al Bandar Rotana also offers Club Rotana rooms with additional benefits including an Executive Lounge and personalised services.Guests are spoiled for choice with five dining options to suit every taste and occasion. From seasonal authentic food at Gusto Italian Restaurant to Morgan's Gastropub, the only gastropub in the area, you are in for a real treat. For casual meals, all-day dining restaurant Salt & Pepper is just the ticket, while Vanilla Lobby Lounge is the place to enjoy tea, coffee and snacks. All outlets are complemented with a terrace overlooking stunning views of the Creek and Dubai's skyline. Refreshing drinks and snacks can be savoured at The Deck Pool Lounge, while in-room dining is available around the clock.Your meeting and event needs are well looked after too with six fully-equipped venues with natural daylight, offering flexible set-up options to accommodate all requirements and occasions. Take care of your body and mind at the Bodylines Fitness & Wellness Club featuring a modern gym with cardiovascular and free-weight training areas, as well as a swimming pool and sauna, steam and massage rooms. Yes, Rotana Earth. "Rotana Earth" is our Global Corporate Sustainability Platform, a comprehensive framework that addresses environmental, economic and social sustainability to be implemented at all new and operating hotels, resorts, apartments and residences. The goal of the earth platform is to guide our transition to sustainable development and setting fundamental values and principles for building a just sustainable future for the community of life on earth.Rotana Earth's strategic sustainability goals commit us to demonstrate leadership in the three bottom lines: Economy, Society and Environment, applied in our key sustainability areas: our environment, our colleagues, our guests, our suppliers and our communities, together with the over-arching area of our governance. Al Bandar Rotana is just a few minutes from Dubai International Airport and Dubai World Trade Centre. Local Shuttle Info: La Mer Beach (once daily) and Dubai mall (twice daily). 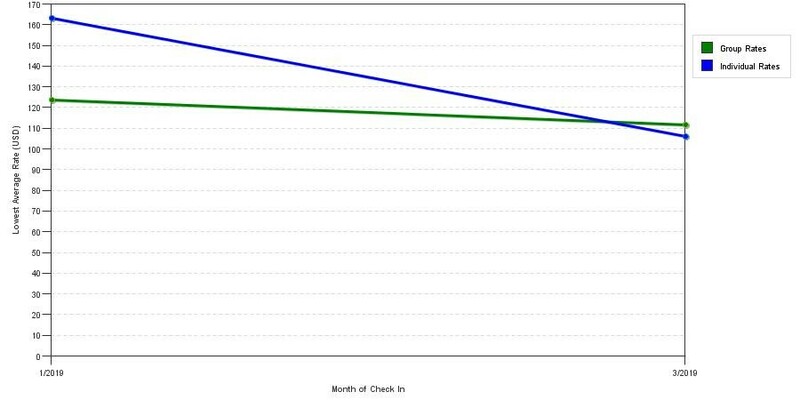 The graph above is fluctuations of room rates for both our group rates and the lowest online individual prices we could find at the time the group/meeting offer was placed. The best group/meeting rate displayed is 44.4% in the month of February 2019 and the highest average individual rate is $239 in the month of December 2018. This chart will show past seasonality and also project future months. If you are flexible with dates, you may want to consider staying at Al Bandar Rotana & Al Bandar Arjaan by Rotana in a month when rates are lower. 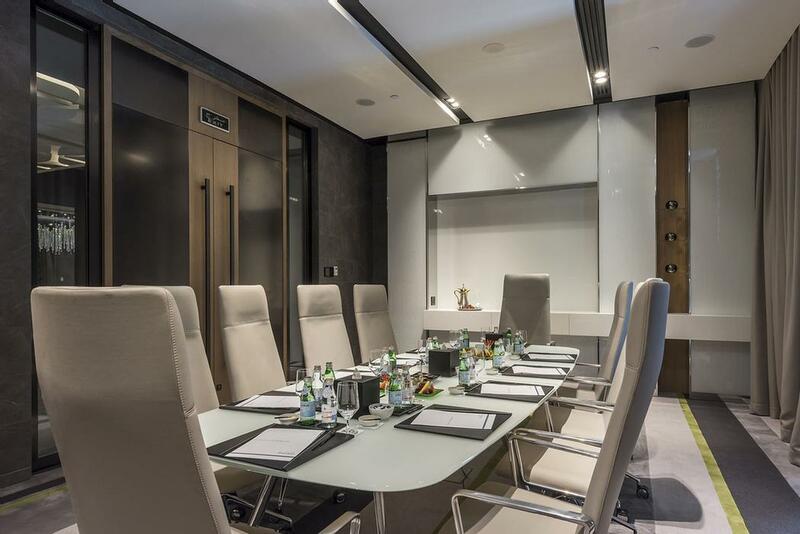 Below are the meeting, banquet, conference and event spaces at Al Bandar Rotana & Al Bandar Arjaan by Rotana. 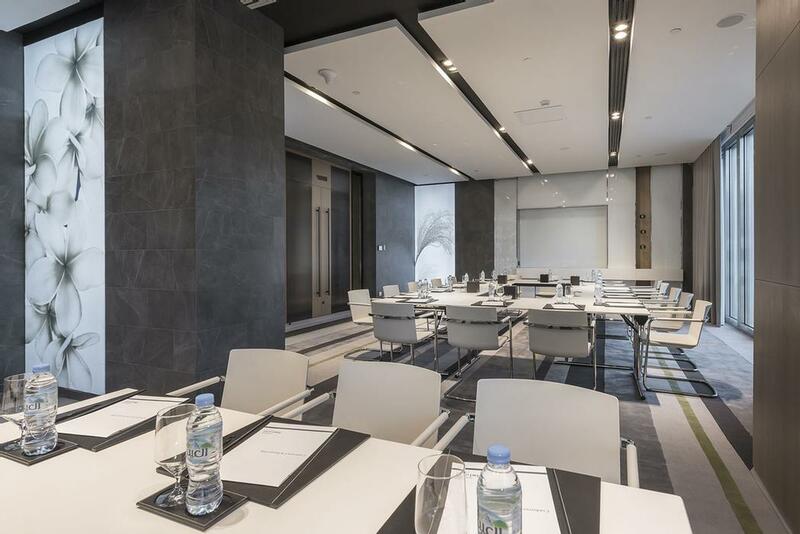 Feel free to use the Al Bandar Rotana & Al Bandar Arjaan by Rotana meeting space capacities chart below to help in your event planning. 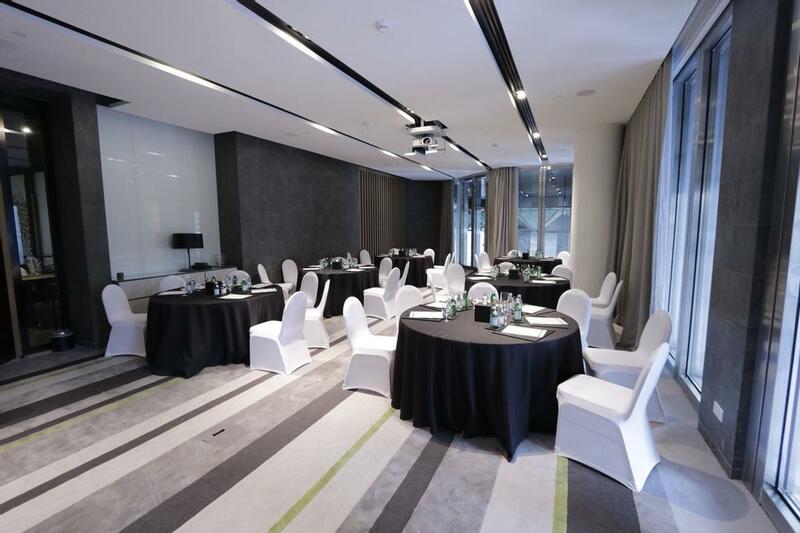 Hotel Planner specializes in Dubai event planning for sleeping rooms and meeting space for corporate events, weddings, parties, conventions, negotiated rates and trade shows. 7 x 5 x 3 M.